Cartiera San Giorgio was founded in 1974. 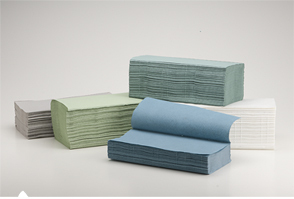 The paper mill is specialized in the production of crepe paper mother rolls for towels, of different types, weight and colours according to the needs of our customers. An accurate choice of the raw materials and their targeted different combinations in pulps, assure quality standards that make San Giorgio’s paper well known and appreciated all over the world. Cartiera San Giorgio produces mother rolls (max. 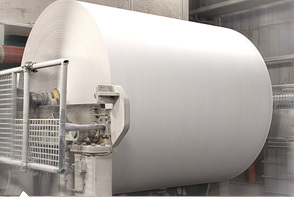 width 2,44 cm trimmed roll or 2.48 cm untrimmed roll or submultiples to fit the machine width). The paper weights range from 30 to 70 g/m2 and beyond. At present the mill produces about 60 tons paper per day. 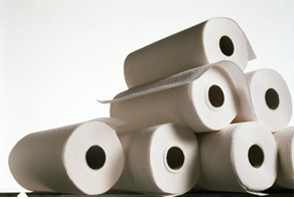 The tissue paper produced by Cartiera San Giorgio is particularly appreciated by paper industry because of its compactness and extreme workability determined by the creping that occurs in the wet phase of the production process (wet creped). Thanks to a partnership with a subsidiary converting line, Cartiera San Giorgio can provide a full extensive range of towel rolls and of C-fold, V-interleaved, Z-interleaved finished towels. The acronym AFH (Away From Home) stands for all those tissue products for hygienic and sanitary uses in public places (hospitals, hotels, schools etc.). Cartiera San Giorgio has been offering a high quality service to retailers, wholesalers and importers since 1973. Jumbo rolls or mother rolls are semi-trimmed to a 2,44 cm max. width ( 2.48 cm untrimmed rolls) or submultiples to fit the machine widht. The paper weights range from 30 to 70 g/m2 and beyond.